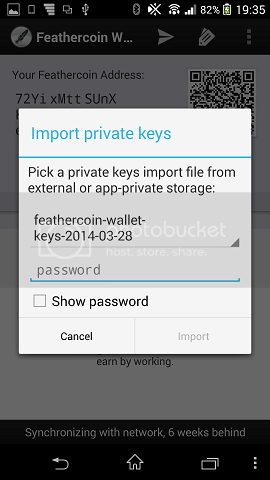 If you currently have the Android Wallet on your device carry out the following steps to take a back up of your keys. 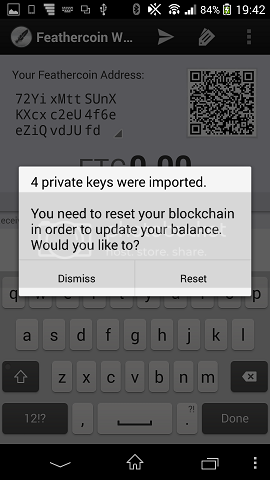 If you don’t currently have the wallet installed skip to step 5, and miss out the steps for importing your private keys. 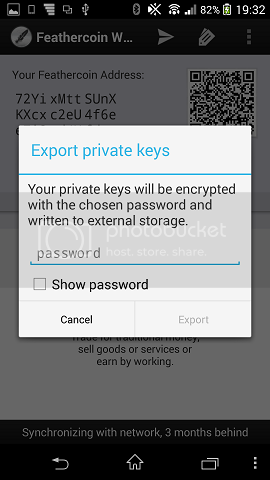 Enter a password and then tap ‘Export’ keep this password safe without it your keys are lost! you have been warned!!! Thats about it, after some time your wallet will complete the sync and any coins that where held in your original wallet will be in the new version. As always if you need any help please ask, I’ll do my best to answer questions. I’d also like to suggest that this should be easily available from the homepage. 'cos it’s slightly hidden in the forum section in my opinion. These kind of guides are very useful, especially for those who are uncertain on how to go about backing up, restoring etc. However, I’m guessing those who land on this page are pretty comfortable with it already. I think having something on the front page that can direct (new) people to some sort of quick start guide would be helpful. 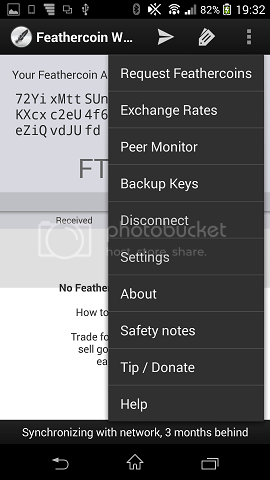 A step by step manual surrounding Feathercoin. I just think that if she found the homepage confusing, there’s probably many more like her. We can’t really expect people to route through the forums to learn more. A beginners section easily accessible that conveys the message/meaning of FTC would be greatly beneficial. Convenience is the key. Hi fjÃ¦rmynt, The forum getting hacked did cause us to have to restrict potential site features, for security reasons. Its a good idea linking to Guides, it ended up buried because we had too much going on and that was confusing. 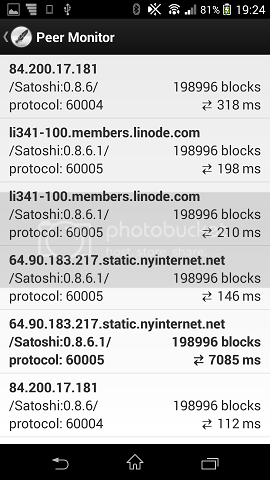 Up untill now we have been supporting miners, markets and developers. 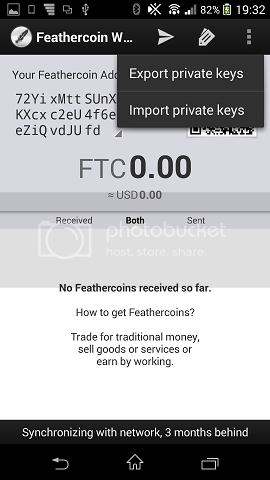 Soon we will have to do more for the common user, I’m concerned that we look more like a charity site on the home page, just where new users need to be directed to Guides and help using Feathercoin.